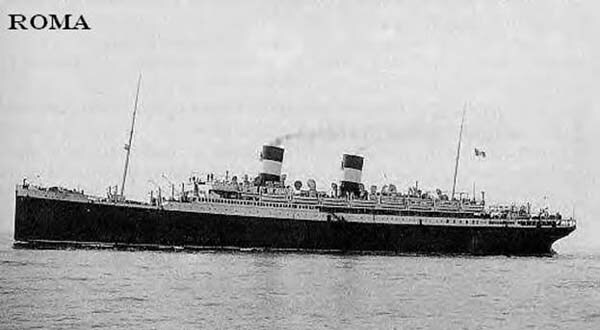 Roma was the first of two near identical ships built for the Italian shipping company Navigazione Generale Italiana. The launch of her sister ship Augustus took place a few months later. The main difference between the two ships was that Augustus had been fitted with the more economical to run diesel engines. Roma set out on her maiden voyage from Genoa - Naples and New York September 21st 1926. In 1932, Benito Mussolini forced the larger Italian shipping lines to merge into one company under the name the Italia Line. Three years later, Roma was transferred from her original route to the Genoa - Naples and South America run. 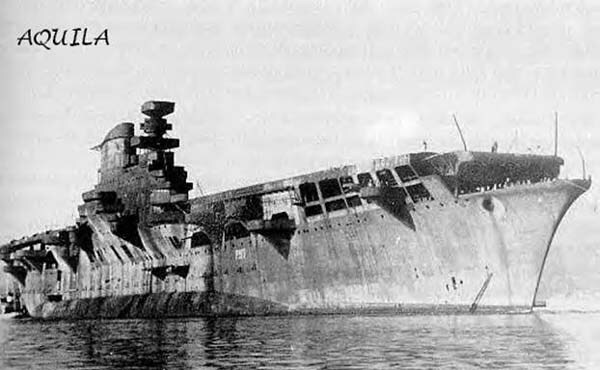 After the outbreak of World War Two in 1939, Roma and Augustus were handed over to the Italian Navy to be converted to aircraft carriers. The navy had Roma renamed Aquila before work on her conversion began. This work included removing her superstructure, installing more powerful turbines to give an improved speed of 30 knots and fitting a full-length flight deck. Augustus was renamed Spavario before undergoing her rebuild. The navy ended all work on this conversion a few months later as Italy’s steel supplies were running low. German forces sunk Spavario at the mouth of Genoa Harbor to form a blockade in September 1944. With Aquila’s conversion still not complete by 1945, the retreating German forces planned to sink her at the entrance of Genoa Harbor as well. To prevent the loss of another ship, Italian frogmen used limpet mines to scuttle Aquila at her berth April 19th 1945. Aquila was raised in 1946 and towed to La Spezia to await a decision on her future. Five years later, she was sold for scrap and dismantled between 1951 and 1952. Spavario had also been raised in 1946 and scrapped at La Spezia in 1947.